With the nation and the world weathering the current storm of economic turbulence and the possibility of a full-blown recession—due at least in part to the ticking time-bomb that was America’s Wild West of a subprime mortgage market—many will view Laura Dunn’s mesmeric documentary The Unforeseen with a mixture of fascinated dread and I-Told-You-So self-righteousness. Although it seems initially a limited-focus story about how a planned housing development in Austin, Texas, threatens to pollute the much-loved Barton Springs swimming hole, the film quickly opens its narrative much wider. By the time The Unforeseen is done, it’s proven to be nothing less than an eye-opening lesson in much of what’s wrong about how we live today. 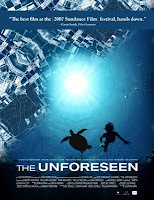 The Unforeseen played the festival circuit last year but will be opening in limited release tomorrow. You can read the full review at Film Journal International. Even in the heart of Potsdamer Platz — that clutter of wind-swept plazas and tightly-packed hotels, shopping malls, and high-rises near the confluence of east and west Berlin that looks like a modern American urban anywhere (only packed with Europeans) and serves as the de facto center for the Berlinale International Film Festival — where the past roared loud and clear amidst the din of international cinema’s hustling and bustling. Granted, a good part of film festivals’ raison d’etre is displaying what’s new and upcoming, and so it was that from February 7th to 17th, Berlinale introduced a host of works from new and little-seen filmmakers hailing from all (well, most) corners of the planet. 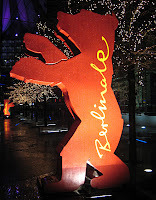 At the same time, festivals like Berlinale are almost as much about the business end of things, such as the aggressive scheming happening over in the buzz-laden conference rooms of the concurrent European Film Market (EFM) — the hive of distribution dealmaking that’s arguably more important than anything happening at the open-to-the-public screenings. It was there that the business of getting films made is reported on so feverishly by the daily trades, the announcement of Scorsese’s Bob Marley project, deals rumored for Sam Raimi’s Ellen Page-starring horror film Drag Me to Hell and Oliver Stone’s film about George W. Bush, and early footage being screened from Steven Soderbergh’s first of two Che Guevara films, The Argentine. You can read my coverage of this year’s festival, including reviews of the Philip Roth adaptation Elegy and the amazing restoration of the lost 1961 neorealist American classic The Exiles, at filmcritic.com. One of the first of many vividly expressed moments of honesty in Frederik Peeters’s autobiographical graphic novel, Blue Pills: A Positive Love Story, comes very early. Cati, the thrilling and beautiful woman the somewhat glum Peeters has just fallen for, tells him that she is HIV positive. A trio of panels follow in which Peeters’s shrinking figure is surrounded by a rush of his “most extreme feelings”—outpouring of thick, blackly lettered emotions that range from passion and pity to desire, flight and sadness. First published in 2002 in Switzerland, Blue Pills is an off-kilter and moving account of Peeters and Cati’s relationship, which undergoes trial after trial at the hands of her invisible but frightening condition. The full article on Blue Pills was published in Publishers Weekly. Writer/director McDonagh has dabbled in fairy tales before, in his grimly funny and ultraviolent stage plays like the Tarantino-esque The Lieutenant of Inishmore and, particularly, The Pillowman, which knocked Broadway audiences for a loop back in 2005 with its mix of bloody, Grimms-like Germanic storytelling and anonymous, Kafkaesque modernity. With his feature directorial debut In Bruges, McDonagh takes his particular theatrical affinity for finding cockeyed laughs in horrendous situations and creates a precisely structured and knock-you-down hilarious comedy of violence with a film that (hopefully) announces a great new cinematic talent. In Bruges is playing in arthouse release right now. Read the full review at filmcritic.com. A random sampling of the citizenry would most likely (if years’ worth of polling, and a general lack of public outrage, can be believed) come up with a good number of people who may not like torturing all them Middle Easterners, but hey, it’s an ugly world…. It’s for those people in particular that Alex Gibney’s deeply unsettling documentary Taxi to the Dark Side should be required viewing, though just about any citizen should feel the film worthy of their time. Gibney, who did a smart job of untangling the tortured and headache-inducing mess that was the Enron case with 2005’s Enron: The Smartest Guys in the Room, does similarly swift work here cleaving through the morass of obfuscation and half-truths that have veiled the country’s involvement in torture and extralegal detention since 9/11. Taxi to the Dark Side is still hanging around in limited release; check it out while you can. The full review is at filmcritic.com.